Mail theft is on the rise and thieves are getting more and more brazen. In addition to potentially losing your checks, your mail-order medication, and your packages, mail theft is a fast track to identity theft as well. Is there a way to protect yourself? To solve this problem for myself, I looked into security mailboxes for a solution and I haven’t been disappointed. But be careful! Some so-called security mailboxes are in reality extremely easy for thieves to breach. These are the top 10 security mailboxes I found in my extensive research and testing. We’ve weeded out all the locked mailboxes that aren’t really secure. Although some of these mailboxes do have a few minor security risks, they offer excellent protection for your mail. In addition to the obvious look at security measures, I considered things like overall capacity, durability, price, and design. Officially approved by the United States Postal Service, this extra large mailbox is designed to make theft unlikely. Measuring 21.5″ D x 16.5″ H x 12″ W, there is plenty of room for a large volume of letters and for some small packages. “Mail Shield” technology that prevents fishing and the anti-pry latch locking mechanism keep your mail and packages safe. The mailbox is built tough from heavy gauge galvanized steel. In addition to protecting you from thieves, the powder-coated finish on this mailbox also protects against the elements. Although it is quite large and draws attention for that reason, it is a very nice looking mailbox. It’s available in your choice of colors and it should stay looking great for years to come. Installation on an existing post or other insert surface is easy, using the Fast-Trak Mounting Plate. You also get 3 keys, reflective house numbers, 4 lag bolts and a drill bit for secured installation. 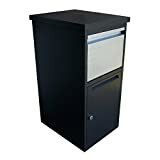 Verdict: Although the Mail Boss Package Master Security Mailbox stands out for being USPS approved and for offering superior anti-theft measures. Overall, this is our top choice amongst the best security mailboxes (for most people). 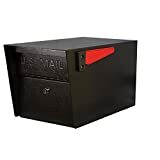 If you want the superior anti-theft protection of the larger MailBoss box but you don’t expect many packages, this smaller best-selling product from the leading brand MailBoss might be a good fit. It, too, is USPS approved. It’s also made from heavy gauge galvanized steel, offering durability and strength. There are the same Mail Boss anti-theft measures in place. A unique anti-fishing baffle door and an anti-pry latch locking mechanism keep would-be thieves out. Measuring 21″ D x 11.25″ H x 10.75″ W, this box is large enough to hold quite a lot of letter mail plus some small packages. Installation of this box is easy and it comes with all necessary installation hardware. An Amazon’s Choice product, buyers have given this a 4.6-star average, as of this writing. The majority of reviewers praise the box for looking great and doing what it is supposed to do. A few buyers do caution that there is some tendency for water to get in when it rains. Verdict: The Mail Boss 7506 is durable, offers some excellent anti-theft measures, looks great, and is approved by the USPS but it has a few design flaws that aren’t insignificant. 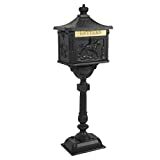 Measuring 12.5″ W x 13.625″ H x 18.25″ D, this mailbox has three distinct sections. On the top, there is a tray for outgoing mail. Beneath that, there is an incoming mail deposit section for your mail carrier to drop off your mail. The largest section, on the bottom, is where your incoming mail is kept securely under lock and key. There are two different locked doors, one in the front and one in the rear. Available in a few different colors, this aluminum box is solidly built and has a durable powder coated finish. This is yet another mailbox with great reviews and official approval from the USPS. Installing this mailbox should be relatively easy but you, unfortunately, do not receive any hardware to do the job. As with any security mailbox, one of the biggest challenges and concerns is that there is the potential for a mail carrier to use the box incorrectly. When this happens, your mail isn’t protected and thieves can access it without much effort. Generally, once your mail carrier understands how to use the box, your mailed items should be safe. Verdict: The USPS approved Salsbury Industries Roadside Mailbox is decently large, durable, and reasonably secure (one of the best) but no installation hardware is included and when mail is deposited incorrectly, it is open to theft. 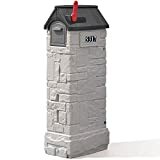 If you tend to get a lot of mail including small to medium packages, this MailMaster mailbox might be worth considering. Looking at a picture, you might think you don’t need to install this on a post because the post is almost built right into the design. However, you really do need to attach this to a 4×4 post that is cemented into the ground. Otherwise, someone could just easily pick up the whole thing and walk away with all your mail. The dimensions are 28″ H x 6.25″ W x 13.25″ D and the design is faux brick with a rooftop. From a distance, these architectural mailboxes look great but up close they are obviously plastic and a bit cheap-looking. Several reviewers on Amazon include pictures of how they painted it to make it look more like real stone. When painted in this way, this mailbox can add a ton of curb appeal. One security measure is the hidden access door. You get front and rear access to the interior compartments. The heavy-duty poly construction is fairly durable. A unique aspect of this box is the trap door. When the trap door is in place, your mailbox is about the size of a typical mailbox, this might be the best solution if space is a major concern. If you will be out of town for a while, you can remove the trap door and open up a much larger space for your mail to collect. 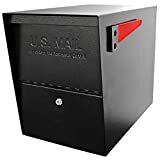 Verdict: The MailMaster StoreMore Mailbox is a good value buy overall as it offers a huge storage area for mail and hidden access door locks but it looks a bit cheap and it is not officially approved by the USPS. Officially approved by the United States Postal Service, this extra large mailbox is designed to make theft very unlikely. Measuring 21.5″ D x 16.5″ H x 12″ W, there is plenty of room for a large volume of letters and for some small packages. “Mail Shield” technology that prevents fishing and the anti-pry latch locking mechanism keep your office mail and packages safe. The mailbox is built tough from heavy gauge galvanized steel. In addition to protecting you from thieves, the powder-coated finish on this mailbox also protects against the elements. It will have no problem accepting letters and small packages but the max package size is 13.0″ W x 8.0″ H x 11.25″ D.
This is just the top portion of a larger and more expensive “vault” system that collects all mail deposited through the maildrop. It’s possible to just use the top portion without buying the vault piece but it definitely works better when both parts are used together. As mentioned previously, the biggest potential downside to this option is that it takes quite a bit of work to install. If you aren’t well-versed in home remodeling or DIY activities, this might be a bit over your head. Making things worse, no printed instructions are included with this. You can find the instructions here on Dvault’s website, however, and they are relatively easy to follow. Verdict: Although the DVault Wall Mounted Package Drop is one of the most secure mailbox options out there, it is quite expensive and requires some serious DIY skills to install. Measuring 18″ D x 15″ H x 11.5″ W, this is another large box that does have official approval from the Postmaster General of the USPS. Available here in a few colors, the construction is solid and durable. It features heavy 16 and 18 gauge galvanized steel and a fully powder coated exterior. Stainless steel hardware and other corrosion resistant materials ensure that the box will stay looking good and function well for a long time. Rubber seals on the doors keep moisture out so you don’t have to worry about rain leaks ruining your mail. Installation is fairly straightforward for this letterbox and you can mount it on a pilaster or column as well as a wood post. For wood post installation, however, you will need to purchase separately this special adapter plate. 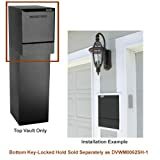 Among the security measures in this mailbox are a pry-resistant lock bracket, a high-quality tamper-resistant locking system, anti-pry latch reinforcement, and an internal security baffle. Despite these very good, almost perfect measures, buyers do report that there ways for determined thieves to get in. Most troubling, fishing does seem entirely possible with this mailbox. Verdict: The Oasis Classic Large High-Security Mailbox offers a large mailbox with several excellent security measures and a welcome leak-proof design but it has a few concerning security loopholes. Do you want your mailbox to just be a place to get your mail or do you want something unique and special? If you’d prefer something with a bit more character and flair, this classic style post box might be right up your alley. Made from powder-coated aluminum, this pillar box is designed to look like a Victorian era traditional cast-iron post box. Sitting atop an ornate post, the cube-shaped box with a pointed roof depicts symbols of mail delivery from its earliest days: a “pony express” mailman on horseback and a posthorn for announcing the mail’s arrival. This box is all black except for the mail delivery slot which is emblazoned in gold. This mailbox is 46″ tall X 16.5″ wide. It has room to hold quite a few letters and perhaps a small package or two but there is definitely no room for even medium-sized packages. Installation is relatively straightforward. Verdict: If you want a bit of extra security through a locked mailbox but care even more about having an attractive design with unsurpassed historical flair, this Cast Aluminum Postal Box might be your best bet. The classic wall-mounted mailbox design featured a boxed door for mail with a newspaper holder underneath. This is a security mailbox upgrade to this classic design and those loyal newspaper readers will be happy to know that there is a still a place for the newspaper. The newspaper area isn’t secure so if newspaper theft is your concern, you’ll need to come up with another solution. The mailbox itself is secure. There is a mail deposit door for the mail carrier to use. ail then drops down into a larger locked storage area that you open with a key. The stainless steel box itself is sleek and attractive with a minimal, modern design. Dimensions for this box are 12” L × 4.7″ D × 15.7” H. The letter slot measures 11.5” L × 2.8” H. Installation is relatively easy as there are four pre-drilled holes on the backplate and you do receive the necessary screws to install it properly. You do get two keys with this box in case you lose one. Verdict: This nice-looking modern design Wall Mount System With Newspaper Roll from Getza isn’t the most secure mailbox overall, or the best product in this category, but it does offer a basic level of protection at a very attractive price point. This is yet another excellent security mailbox from Mail Boss. Like the other boxes from Mail Boss, this one is officially approved by the USPS. It offers a large area for accepting plenty of mail as well as some small packages. The dimensions are 21″ D x 11.2″ W x 13.8″ H and the incoming mail slot has a height of 1.9″. That mail slot is big enough to accept a standard box of checks, to give you an idea of the size of packages or mail bundles it can handle. The capacity is ultimately large enough to collect a few weeks of mail so it’s a good choice if you travel frequently and don’t want to put a hold on your mail. Security is paramount with this box. There is an anti-pry latch locking system that includes a high-security 12-disc wafer lock. In addition, the box itself is made from galvanized steel and it is virtually indestructible. Thieves aren’t the only thing this box protects against; the weather is also on notice as the stainless steel hinges and powder-coated finish offer superior resistance to the elements. Installation to an existing post is fast and easy using the Fast-Trak Mounting Plate and you receive everything you need to mount it successfully. You also receive 3 keys and reflective house numbers. Although the price tag is a bit high, buyers stress that it is very much worth the price, with one Amazon reviewer calling it a thief-repelling “Ft. Knox”. This box looks nice for what it is but it does resemble a commercial mailbox more than a typical home box. It will definitely stand out amongst the other curbside boxes in the neighborhood. Verdict: Mail Boss really does protect your mail like a boss and this large-capacity Mail Boss Curbside Locking Mailbox is no exception. If you are regularly receiving packages and don’t want thieves to enjoy your purchases, you probably want a security box that has room for larger packages. This box won’t hold really huge boxes but it can definitely handle more than just really tiny packages like some security mailboxes. Measuring 20.8″ D x 16.8″ W x 35.5″ H, there is plenty of room in this mailbox. 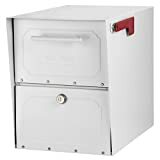 It features a secure parcel chute for small to medium packages. In addition, you could leave the bottom locked area unlocked when expecting a larger package for your mail carrier to use. After putting your package inside, the mail carrier can close the door to lock it. This box features a 3-way locking system and has a re-settable combination lock, this is one of the best safety measures possible. You can secure this box to either a wall or the ground and the necessary installation hardware is included. Powder-coated galvanized steel offers durable protection from the elements. Verdict: The Secure Dropbox Parcelwirx System is ideal for those who receive a lot of packages and features good protection from thieves but it is on the expensive side and it does require you to crouch down to retrieve your mail. This is the absolute best solution to fight package theft. Is there any product recommended by the USPS (United States Postal Service)? 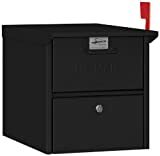 The Mail Boss Package Master, the Mail Boss 7506, the Oasis Classic Large High-Security Mailbox, and the Salsbury Industries Roadside Mailbox are the best mailboxes on this list that are officially approved by the USPS. There are actually specific guidelines that a mailbox must meet, as you can see on the USPS website. As long as the mailbox fits within those guidelines, it should be fine. Several other boxes on this list, like the DVault Wall Mounted Maildrop, are well within the USPS guidelines. However, the official recommendation for mailboxes that lack the Postmaster General’s Seal is to confirm with your local postmaster that the mailbox is acceptable. It should also be noted that your neighborhood or homeowner’s association might have rules or guidelines for what mailboxes are acceptable. You might want to check into this before purchasing a security mailbox if you live somewhere where this might apply. What’s the most heavy-duty secure mailboxes here? 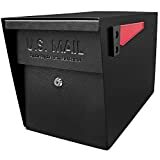 Either the MailBoss Package Master Security Mailbox or the MailBoss Epoch 7106 is the toughest, heaviest, most heavy-duty mailbox on this list. That said, being heavy-duty isn’t necessarily the most important factor when wanting to deter thieves. Other security measures are more important. Luckily, the MailBoss mailboxes are not only best-in-class for build quality, but they also have excellent anti-theft security features. 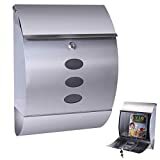 But if you want the mailbox that is absolutely as secure as possible, you should look at the DVault Wall Mounted Package Drop, the foremost product from Dvault is unbeaten when it comes to getting rid of package thiefs. Even though that isn’t technically a mailbox, it is the most secure option for protecting your letters and packages. What post do you recommend and how to install it? There’s no one best post. It depends in part on your personal curb appeal aesthetic and the box itself. You have a lot of options. In many cases, it makes sense to stick with the same manufacturer of the mailbox. The MailBoss mailboxes, for example, work best with the MailBoss in-ground post. To be as secure as possible, you do typically want an in-ground option involving cement. Your optimal post could be steel, or wood, or even plastic but it’s important that it is really securely planted in the ground. For installation and insert tips, there are a number of great YouTube tutorials like the one from Chris Noto, to walk you through the process. If you’re all about the DIY, there’s no reason you can’t try your hand at making your own security mailbox. Just remember to keep in mind that USPS has some fairly strict guidelines for mailboxes. It’s important to make sure that your mailbox fits within these guidelines. Fair warning: to make a mailbox that is truly secure and fits within the USPS guidelines, it may well end up costing you a fair amount of both time and money. If you find happiness in the process, then, by all means, go for it! For everyone else, there are plenty of good options that are already proven to be secure and that fit the USPS standards. Another unique DIY option is to make a remote mailbox surveillance alarm that alerts you when your mail has been delivered, as seen in this tutorial. This is certainly a good option for when you’re home but it doesn’t do anything for actually stopping a thief. You can also purchase a wireless mail alert system that lets you know when your mail arrives, or whenever someone opens your mailbox. The most effective defense against thieves, a security mailbox can give you some serious peace of mind so you don’t have to worry about thieves stealing your mail or even your identity. After installing your security mailbox, you will likely get questions from your neighbors. You might soon have a neighboorhood full of these, especially if there has already been some mail theft in your area. Has your area been struck by mail thieves? Did your mail get stolen? If so, you might want to share this post with your neighbors and friends so they can prevent having this potentially disastrous experience. Do you have your eye on any of these security mailboxes? Let me know in the comments! Feel free to ask any mailbox questions here as well. Hello, what is the best locking, security mailbox to insert into a brick and morter encsasement by the curb.